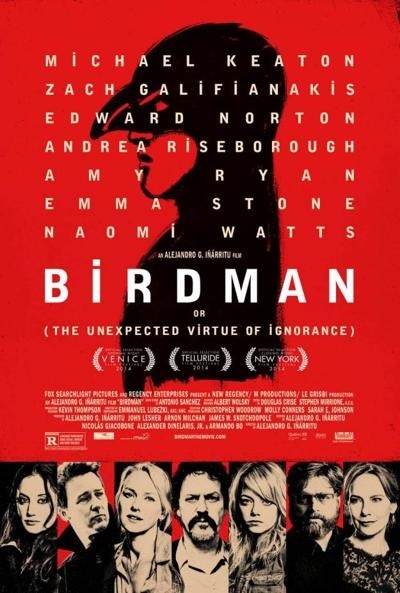 First things first, Alejandro González Iñárritu’s tragicomic backstage character drama Birdman (B) is often brilliantly bonkers, and Michael Keaton gives a command performance at the film’s core as a fading Hollywood film star trying to reinvent himself on Broadway while suffering an all-out mental breakdown. With long tracking shots through claustrophobic corridors, a percussive jazz score rat-tat-tatting through the spiraling series of devolving events and tidbits of comic book flourish and fantasy that would be at home in a Terry Gilliam film, this dark delving into the damaged psyche of a thespian on the brink of obscurity pounds its themes with a bit too much prescience. The film comes most alive in its moments of inspired mania that spring from real-life conflicts such as dealing with harsh critics and handling acting egos with kid gloves. Quite frankly, supporting performances by Ed Norton as an obnoxious actor in the on-stage drama and Emma Stone as Keaton’s real-life daughter steal the show a bit with audacious turns of their own. Stone gets a great soliloquy encapsulating the essence of modern-day relevance. The film is a brittle amalgam of too many themes boiling in one big pot; but its insider’s take on exorcising one’s demons, conquering the temptations of fame and reconciling the notions of love and admiration is likely to appeal to artists’ temperaments more than the mainstream. It’s a treat to see Keaton get to sink his teeth into such a flight-of-fancy performance, and both West Coast and East Coast entertainment industries get their share of skewering in this uneven but often shrewd satire.